We Pay Shipping to the US 48 states on this item! In Stock This item has been replaced by the NEW SoloStar 3 Juicer. The practical low-rpm single auger juicer. Unique dual-stage extraction process and larger single auger result in greater juice yields with less pulp mixed in the juice. Tribests new & improved SoloStar II with a larger auger and unique dual-stage juicing process, is the affordable way to obtain high-quality juice bar performance from an extremely efficient home juicer. In order to deliver more juice from your produce, the SoloStars auger is longer and heavier than its competitors. The auger effectively forces produce through the grinder while enhancing the SoloStars simplicity of operation. 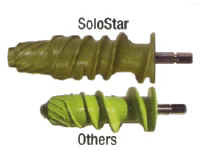 SoloStar also utilizes a unique dual-stage process that extracts juice more efficiently than other single-auger juicers. It filters out juice during an initial crushing phase before it can be reabsorbed into the pulp, then squeezes the remaining pulp in a secondary pressing phase for maximum yield. During the secondary pressing stage, the pulp is squeezed through a screen that has more surface area than any competitor, this may explain the higher yield produced in the SoloStar II Juicer. The result is fresher, natural tasting, live juice from most fruits, vegetables, leafy greens, herbs, and grasses that you could ever want to juice. It also easily converts into a flat pasta or round noodle maker and mochi mill with the accessories included. Solostar's low-speed Auger gently crushes and squeezes produce. Because juice is not heated and mixed with oxygen in the process, the fragile vitamins, nutrients, and enzymes are preserved. SoloStar delivers all the natural goodness and superior flavor that you demand from a top quality juicer. Only the highest quality materials are used in the SoloStar's construction. Its straightforward design and precise assembly insures trouble-free juicing for years. SoloStar is UL & CE approved and meets our highest manufacturing standards. The SoloStar is covered by a five-year warranty on parts and service. 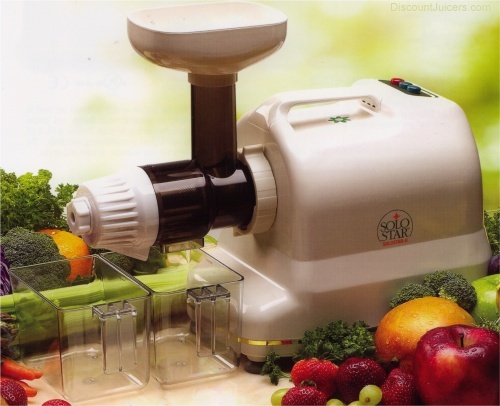 Tribest Corporation has been world renowned for bringing you the Green Power, Green Life and Green Star juicers. Now with the SoloStar, Tribest Corp. celebrates its 15th year of bringing you service, quality and value. Tribest is committed to your satisfaction, and are proud to be of service. 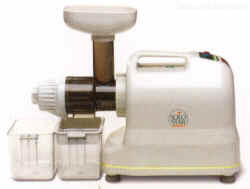 The SoloStar II single auger juicer makes it affordable to obtain fresh, high quality, "live" juice. 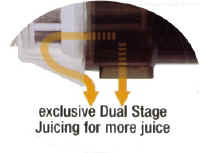 SoloStar's II exclusive Dual-Stage juicing process is extemely efficient. The ejected pulp is dryer than that from other juicers, which means you get more juice out of your produce. Its extremely slow rotation speed ensures that the juice extracted with the SoloStar II is of the highest quality, and of the best flavor, with no heating of the juice. Less oxidation of the juice can contribute to more of the living enzymes and nutrients being extracted intact. SoloStar II makes juicing wheatgrass, herbs and even pine needles quick and effortless. Even the toughest to juice produce is easy with this machine. SoloStar II works great as a food processor. Make your own nut butters, pates' and delicious sorbets right at home. Sauces and baby food are easy to make, and are fresher and healthier than what you buy in the store, because you make it yourself at the time of consumption. Eliminate preservatives and unwanted additives. Many experts agree that we should increase the intake of fresh fruits and vegetables. Grind, chop or mince your favorite spices. Save time by preparing garlic, pepper, onion, ginger, or any other spices with the SoloStar II. Less time in the kitchen means more time with your loved ones. (and we can all use more of that!) Also works great with meat and fish. Make delicious rice cakes with the SoloStar II in the comfort of your own kitchen. See the picture below for the accessories that are included with the solo star juicer.